The preposition avec is used similarly to its English equivalent “with,” but with a few differences. Va-t-il manger avec nous ? Is he going to eat with us? On prend des croissants avec confiture. 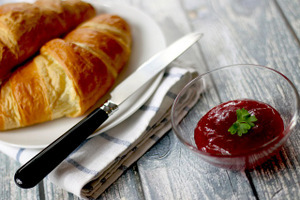 We’re having croissants with jam. Avec ça ? Et avec ça ? Anything else (with that)? Tu es en retard et avec ça tu as oublié le pain ! You’re late and besides / on top of that, you forgot the bread! L’expérience s’acquiert avec le temps. Experience comes with (thanks to) time. On risque d’être en retard avec ces embouteillages. We might be late with (due to) these traffic jams. Comment se comporte-t-elle avec eux ? How does she behave toward them? Elle est très gentille avec moi. She’s very kind to me. Many English adverbs are equivalent to avec plus the corresponding French noun. Dites-le avec des fleurs. Say it with flowers. On ne prend pas les mouches avec du vinaigre. You can catch more flies with honey than with vinegar. Avec is usually followed directly by a noun, with no article in between. Learn more: Prepositions with nouns.